Look at the things that hurt (back, arms, legs, and shines) us the most and then have a company like POC Lab take a look at how to protect them! What you end up with is a full line of Body Armor or Protective gear, that is built to function effortlessly while you play hard. If you are into skiing, Mt. Biking, Motor Cross and even rollerblading you will find a use for this gear. "The body armor has been developed in close collaboration with our back specialists at POC Lab. The Spine back protector and its accessories assures that you get protection for the upper part of the spine, including vertebrae C1 to C7, and also for the lowest part including the caudal area. Spine forms the basis of a modular system that you can trust absolutely. It consists of a flexibly jointed back-shield in a special combination of the latest high-tech materials, anatomically shaped and generously ventilated. We have improved the design of the waistband by widening the bands, which are tapered towards the ends, to add support and comfort. The waistbands also use a new super-strong Velcro that will last for ever." If you are like most we all have a couple bikes and lack of storage. Now most people will hang their bicycles from a hook or lean them up against a wall, bumping into them and getting grease on their cloths. Cycloc is a stylish and great way to get you bike out of the way. In towns and cities, where cycling is the answer to your transport needs, Cycloc provides the practical solution to bike storage in your home. Buy a Cycloc and instantly free-up floor space, so you can win back your hallway. This stuff is great a energy blast from concentrate. I used it for about 5 months then thought hey lets see what happens. Well what happend was that my performance was off, so I'm back on and feeling great. In less than a year they have 4 new products, Concentrate, Chew, Powder and Ready to drink. Now I have only had the Concentrate, so I really can't judge the rest of New Sun Nutrition, LLC., (unless they would like to send me some) and it is great. 2 ounces with 6 ounces of water, and 1/2 hour later I am ready to go. FRS concentrate is the perfect solution if you drink FRS on a regular basis and prefer to drink FRS in beverage form. Each bottle contains 1-2 weeks supply of product and fits conveniently in your refrigerator. The concentrate is also great for adding to your favorite smoothie, seltzer water or juice blend. It comes in Orange Regular & Low Calorie. Would have, Could have, Should have, this is one of those pieces of equipment that all of us wish we would have thought of, Slipstremz a functional ear cover that you can plug your iPod buds into and still be able to hear what is around you. Slipstreamz attach/fasten to a bicycle helmet's straps, keeping the buds away from your ears, enabling your to hear cars coming upon you. If you already ride with your Apple iPod (which is a very bad idea) then you are aware that they keep coming out unless you tape them onto your ears. Then you have too turn the volume way up tp hear anything, the Slipstreamz is the solution it is like having the music playing in the background at home. A nice way to listen to your music while ridding for hours at a time. Burton has done it again, they have really hit the music in motion just right. Knowing their market and working with the top company Motorola. With the Audex they not only combined the ipod, but now Burton has incorporated Push-to-Talk, Two-Way Radio System. This is great and have really pushed the limits. The price is a different thing, whoever said technology doesn't cost these are $400. Hey if you hold onto it for more than a year it could see the justification. Targeting snowboarders who want to listen to music and take/make calls while on the slopes, the jacket has a set of controls in its left-hand sleeve which connect to a set of speakers and a microphone concealed in the hood. Bluetooth connect wirelessly to the Speaker and Micophone. Thanks to Outside Magazine for pointing this one out. It is called the Snow Dork and by the look of it you will know why. They best thing is that with a touch of the brim it screams out the time. How many times have you tried to roll up your jacket to un-bury your watch, what a pain. No velcro and no straps. Press, Listen catch the last chair! Cranking out New Technology, Dr Martin Becker! Special thanks goes to Gizmag for discovering this juicy piece of technology. Dr Martin Becker of the Fraunhofer Institute for Experimental Software Engineering IESE, has developed a chip that uses sensors and actuators to help racing cyclists optimize their performance. There are many different devices out on the market that will measure cadence, speed and power but this one seems to have a different angle. Most of us know that if you want to be on the top of your game you need to be computer monitoring your activity, to see where you are falling short. "Ambient Intelligence will make it possible to constantly monitor and enhance the performance of individual riders and whole teams," says Becker of the Fraunhofer Institute for Experimental Software Engineering IESE in Kaiserslautern. "Each bicycle is fitted with equipment that constantly registers the forces acting on the pedals. Further significant factors are the riderÂs pulse andpeddlingg frequency, the speed and the gradient. All these readings are collected in a processor on the bicycle and radioed to a central processing unit where they are analyzed. The computer delivers individual training recommendations to each rider: He can view them on a display mounted on the handlebars or listen to them over headphones. To enable the cyclists to retrieve information on demand while riding, the Hungarian research team is developing an adaptive component that recognizes voice commands even when they sound distorted due to physical exertion." If you are a complete gadget nut and need to have a device that does almost anything that you ask of it then the Kestrel wind/weather instrument is for you. Now I have been on the water my whole life and I have used many different devices to get the same read out's but I can tell you none fit in the palm of your hand. Sailing in the J24 class for the past 15 years this little device is going to come in handy, adding weight to a J24 can be hazardous to your health if you have a crazy skipper. • Humidity sensor can be recalibrated in the field with our Relative Humidity Calibration Kit. What else can you say, oh yea it fits in the palm of you hand and weighs 3.6 oz..
EASY, SIMPLE and works right away, one setting on the watch (Polar S625X Running Computer) and you are off. I installed this the other day and I am extremely happy. I am really only concerned with speed and time and HR and this is great. It came with 2 different spoke attachments, which was great since I have aero spokes and the handle bar mount I have installed right onto my stem. The hardest part was unpacking that crazy "new" packaging, once through that 15 minutes later and I was off and riding. I wrote about this a couple weeks back, I thought that Nike and Apple had missed the boat not allowing millions of other runners the chance to use this kit. Well Marware has come out with a case that attaches under the shoelaces and fastening it with a strong velcro closure. Not only can you now use the iPod kit on any shoe but you can protect the Sensor from the elements. WOW this thing really work I finally got my USA Triathlon SweatVac Performance Race Hat - in black and I am extremely satisfied. I read about it in the last issue of USA Triathlon so I thought I would give it a try. It has performed better than expected. Light, certified 40+ UPF sun protection, reflective technology, 100% machine washable and less than 2 oz.. "SweatVac products are engineered and designed using a unique blend of the finest technical fabrics. The SweatVac System is a multi-layer system which places Transpor fabric against your skin and wicking layers on the outside. Simply put, SweatVac is the finest athletic perspiration management system available. The SweatVac System allows your body's temperature regulating system to work efficiently, so you can perform at your peak, whatever the weather, humidity or activity level." The swimming part of training for triathlons can get very boring and after 6000 yard can drive you nuts. 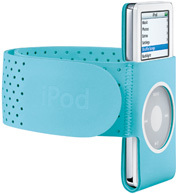 I use my iPod Shuffle for running and biking. I have looked and searched for headphone that could take the punishment of hours in the water. These are great, I need to wear a cap but I can hear the music. It is not crystal clear but something is better than nothing. "Quality Headphones designed to be 100% waterproof with or without the ear bud covers. The headphones are completely submergible and in the water the ear bud covers keep the water out of your ears and hold earphones in. On dry land, remove the covers and use them as standard headphones - they are completely weather proof and even sweatproof - so nothing's going to hold you back from your workout or playtime." Being a mountain biker at heart and a Triathlete for the extra added challenge when I came across this site I was extremely excited. Hans Ray former trials riding world champion, a showman, a stuntman and an adventure mountain biker. He has traveled the world extensively; riding his GT mountain bikes, over and through areas previously considered unrideable. All the while, capturing the cultural, scenic, and spiritual aspects of these exotic locations; and always in search of something mystical or historical. Hans has now opened a indoor mountain bike park that is incredible. It is in Cleveland OH the season runs from October 18th through April 16th, what a way to spend the winter months in Cleveland. I contacted Hans about franchising and unfortunately he was unavailable to offer franchising at this time. He would however come out and help set one up for a fee I am sure,but I really wanted to have his name on the side of the building to help attract young riders. Training Peak is on too something, take all the data sources from the major heart rate watch manufactures have them be able to be uploaded into your Endurance Training System and you captue the market. Training Peaks accepts Garmin, Polar, Timex Bodylink, CycleOps PowerTap and several others. The products offered are Athlete Edition, Training Plans, Messenger, Coach Edition and Desktop Companion. The most popular is the Athlete Edition -- Track your training and your nutrition with fun, simple and powerful online tools. Our online subscription includes a powerful training log, nutrition tracker, detailed reporting, Joe Friel's VirtualCoach, over 475 custom designed workouts and so much more. Try it now, free for 7-days and get your training on track!